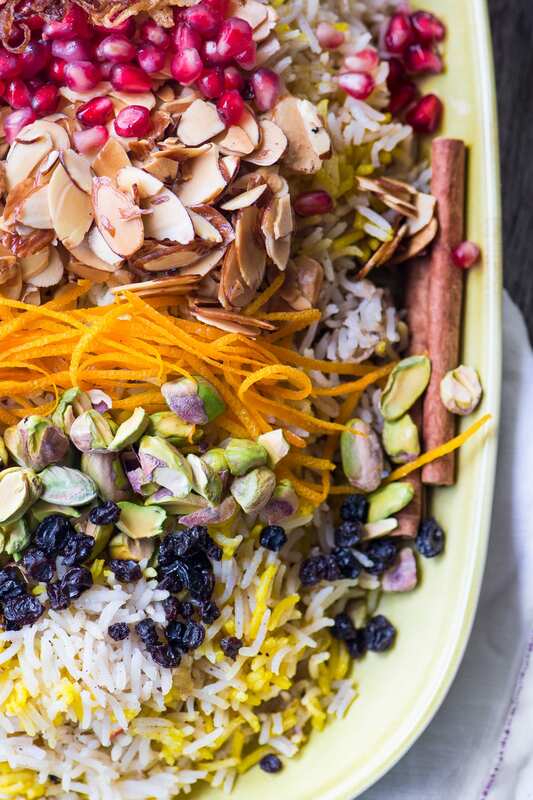 My Fragrant Toasted Almond Rice Pilaf is meant for joyful gatherings ~ it has roots in the ancient cuisines of Persia, India, and Turkey, but I guarantee this pretty gluten free vegan dish will thrill everybody around your table, too! *This post is in association with Nielsen-Massey ~ a brand that I’ve used and loved since I first learned to cook. Thanks for supporting me and the companies I work with, I promise to bring you only the very best, and they help keep TVFGI up and cooking! When Nielsen-Massey asked me to develop a recipe around their line of fine flavors I got super excited, partly because I’ve been a huge fan of their products forever, but also because I love to experiment with flavor. 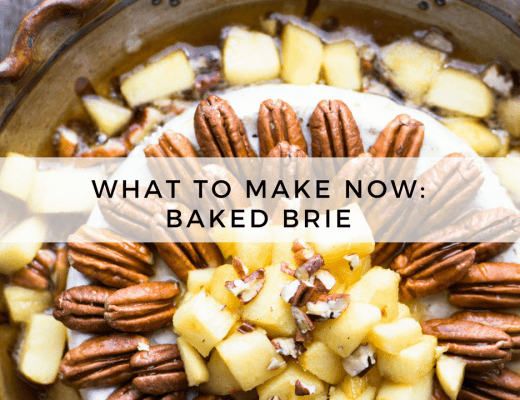 You’ve heard me talk about it a lot here…I like to bump up the flavors in my recipes just a little bit beyond the ordinary, and by pushing those boundaries I end up with food that isn’t just delicious, it’s memorable. That’s certainly the case with this Fragrant Toasted Almond Rice Pilaf. 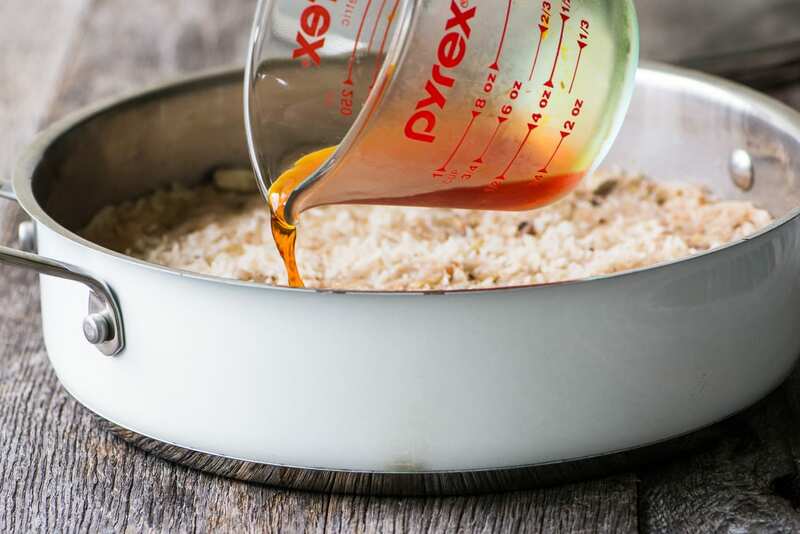 TIP: Of course you’ve used almond extract in baking, but did you know it can also be used in savory foods? 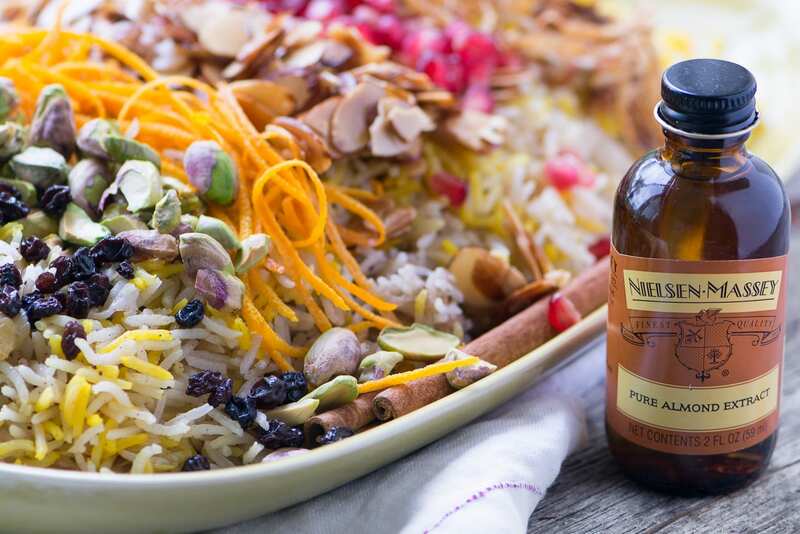 I’ve added a few drops of Nielsen-Massey Pure Almond Extract to take this pilaf to a whole new level. 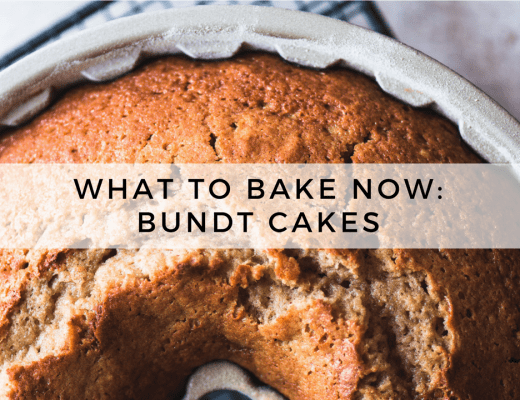 Don’t worry, it won’t taste like dessert, but you’ll get a background note of that gorgeous flavor. 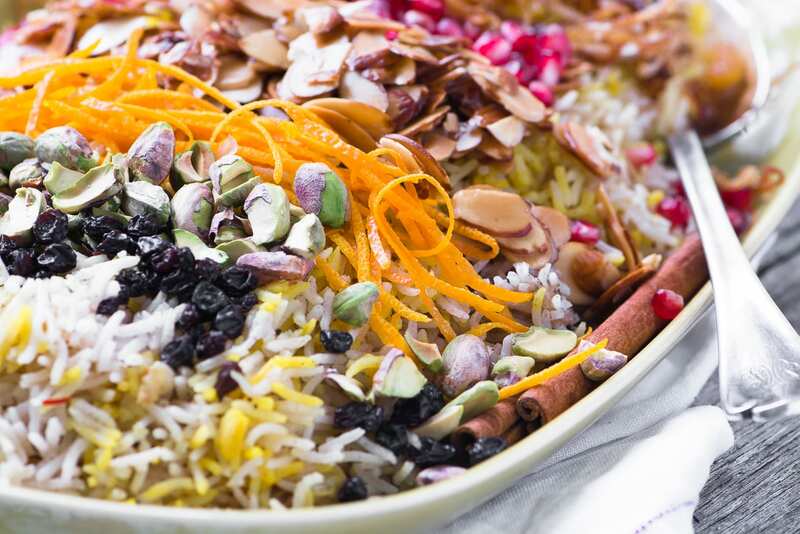 Pilaf, or a dish of rice cooked with vegetables (sometimes meat) and spices is a special occasion food found in lots of cuisines, from the Middle East, to Latin America. They can be simple, or elaborate, but basically they’re an inexpensive way to feed a crowd. It’s definitely the pretty toppings that take this side dish into celebration mode. I’ve used traditional garnishes, but you can of course go with what you like. Dried fruits and nuts are common, as well as those to-die-for fried onions. The finely shredded orange peel is a delicious surprise ~ the sophisticated combination of almond and orange is classic! The aroma of this rice is a huge part of why I love it so much, and people who study this stuff say that over 75% of what we taste actually comes from our sense of smell. One whiff of this warm pilaf and you’ll get it. Whenever I cook with almond extract I always take a minute to inhale straight from the bottle. Almond extract is one of the world’s great aromas, so indulge! Ever wonder why almond extract doesn’t taste like almonds? It’s made with the oil of bitter almonds which is derived from stone fruit pits, so Nielsen Massey almond extract is actually nut free. It’s also cold extracted to preserve all those delicate flavor notes. 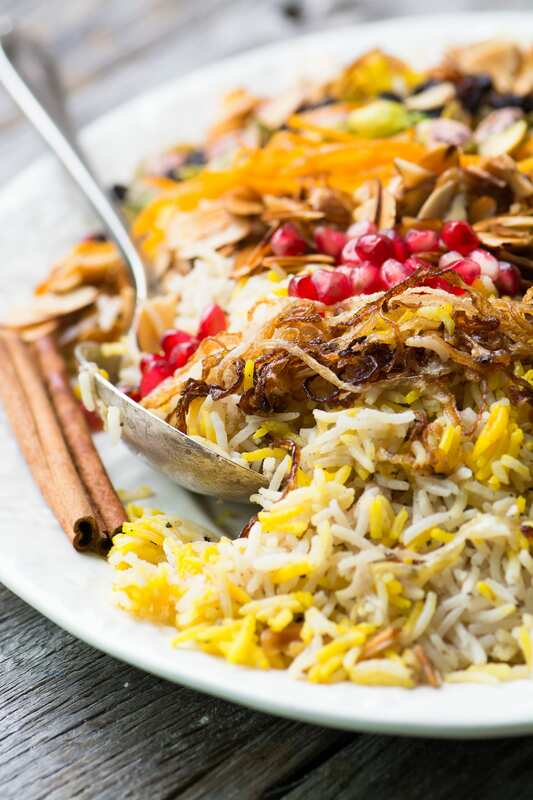 Speaking of great aromas, the aroma compounds in authentic Basmati rice are many times more potent than in regular rice, and for a dish like this it’s well worth tracking down. There are lots of varieties of basmati rice, but I highly recommend buying imported rice straight from India or Pakistan. Most stores sell it, just look carefully. Rice labeled ‘basmati’ is not the real deal unless it comes from India or Pakistan. In face its dna has been codified, and like Parmesan cheese or Champagne, it can only come from one region in the world. That helps keep it real. 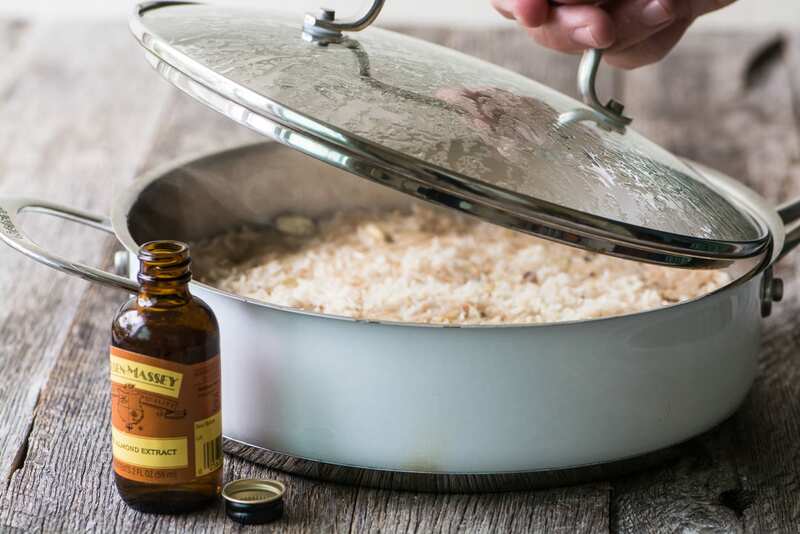 As the rice cooks with the onions, spices, and almond extract, your kitchen is going to smell amazing. This is rice like you’ve never had it before ~ in fact you may want to serve the spiced rice as is, as a side dish for everyday meals. 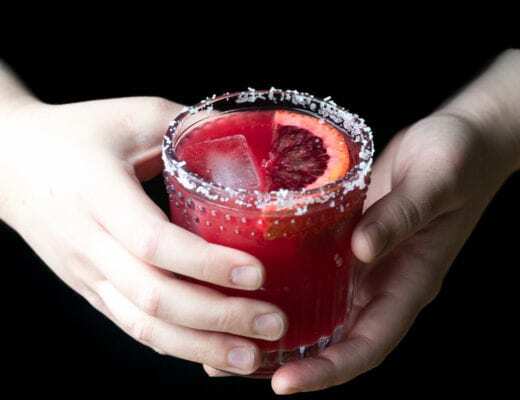 With or without the garnishes, this is fabulous. TIP: To get the pretty yellow and white two toned effect in the rice, like you sometimes get in Indian restaurants, you need to add a bit of saffron infused water after the rice has cooked. Don’t mix the rice completely, let the yellow grains stay separate. Check out Nielsen-Massey on Instagram, Facebook, and Twitter for more flavor inspiration and recipes. Put three tablespoons of very hot water in a cup and add the saffron, crushing the threads between your fingers as you add them. Give it a good stir and set aside. Peel and very thinly slice the onion. Separate the rings, and set aside 1/4 of them for frying. Put about an inch of oil in a pan or skillet and heat until quite hot. Working in batches, fry the onions until golden and crisp. Drain on paper towels. Heat a large pan or skillet and toast the almonds for several minutes over medium heat until they turn golden, Keep them moving at all times, and watch carefully so they don't burn. Remove from the pan and set aside. If you like, you can also fry the almonds in the oil, after you fry the onions. Your choice. In the same pan, toast the whole spices for about 5 minutes over medium low heat, moving them almost constantly until they give off their aroma. Grind in a spice grinder. Add the freshly grated nutmeg. Set aside. In the same pan, add the butter and olive oil and saute the remaining onions for about 10 minutes, until soft. Add 1 or 2 teaspoons of the spice mixture, according to your taste. 1 teaspoon will be relatively subtle, 2 more assertive. Cook, stirring, for a couple more minutes. Add an extra tablespoon of oil if it sticks or seems dry. Add 2 1/2 cups HOT water to the pan along with the salt and almond extract, and stir. Bring up to a boil, then lower the temperature, cover, and let cook, undisturbed, for 12 minutes. Turn off heat but allow to sit for 10 more minutes. Remove the lid and pour the saffron water on PART of the rice. Fluff the rice and pile it on an oblong patter. Don't mix the yellow rice completely into the white, let the colors remain separate. Top with the garnishes and the fried onions. Serve hot. Now for the rest of your almond extract, you might want to use it in some sweet recipes. I’ve got lots! I recommend my SWEET CHERRY ALMOND BARS, and my TOASTED ALMOND MILKSHAKE, for starters. For those beautifully fine threads of orange zest, use an inexpensive zesting tool like this one. You can also find all sorts of inspiring recipes ~ Mango Jalapeño Sorbet anyone? ~ on the Nielsen-Massey website. Head on over! I made this yesterday for dinner and wow! This was enjoyed by everyone at the table I love the texture, colors and taste. It was the right dish for the different dietary choices, we had a vegan, who had it with orange glazed tofu, a pescatarian who had it with orange glazed salmon, A carnivore who had it with herb roasted chicken. Will definitely do it again and again. Just gorgeous, I love all those pretty toppers! This looks absolutely beautiful! I recently made a very simple almond rice pilaf and it was delicious. I can imagine how fantastic this one would taste. I love all the flavor and texture going on. That really is a lovely looking pilaf. Love Nielsen Massey! This looks amazing! I have read reports though that rice is loaded with unhealthy bacteria, especially as it cools to room temperature. Apparently the bacteria embedded in rice is heat resistant and the after cooking environment causes an expeditious multiplication of the spores. We are cautioned to serve it immediately, never at room temperature and to refrigerate it very quickly. Obviously the organisms’ bloom are only slowed down in the fridge, so leftover rice should be consumed asap. Many restaurants serve rice cooked earlier in the day and reheated which is apparently a terribly risky thing to do. I assume you have heard or read articles on the subject. Do you have any concerns about this? Also, do you know if the rice coming from other countries is more bacteria laden? Or, do you find all this complete nonsense. BTW, I still serve rice dishes, but am much more cautious than I used to be. Hi Yolie, to be honest I haven’t done the research on this particular issue so I’ll have to check into it. I do tend to be cautious about leaving food out at room temp too long, but I don’t know about rice in particular, or whether imported rice is any riskier than domestic, but I doubt that. Oh my gosh, such a treat to land on your site and see a whole new look, Sue. Love it!! Clean, easy to navigate and let’s your photos shine – fabulous! Love your dish too. I learned a lot today reading this post but then again, I always learn from you. Your photos are gorgeous! This is a dream for entertaining – can’t wait to make it! Awww, thanks Robyn :) I’m like a kid in a sandbox with the new site! The most beautiful looking pilaf I’ve ever seen! It is so inviting Sue! This is beautiful Sue. I didn’t realize that their almond extract is actually nut free. Good to know since my sister is allergic to almonds and always mentions not to add even the extract. Next time I’m going to do my research rather than just assuming. Great tips, beautiful photo and it definitely looks like a flavorful dish! Oops – I forgot to say how much I LOVE your new look! It’s so pretty, clean and bright and your colorful salads and amazing dishes provide the finishing touches! Good for you! Oh thanks SO much Tricia ~ it’s always scary messing with things, but this turned out great I think! This is such a beautiful dish, with gorgeous flavors. Almond extract is one of my favorites! Thanks Brenda, I don’t know anyone who doesn’t love that flavor, it must be almost universal. All those textures, flavors and aromas in one bowl! What an exciting way to dine. Whaddya know – I learned a lot about almond extract. That pilaf has everything going for it. What a beauty to put on the table AND then eat. I learned so much from this post. I had no idea that almond extract wasn’t made from almonds! I also had no idea that there was terroir involved in basmati rice. Thanks so much for that education! And mercy, but that pilaf looks wonderful. I love all the textures at play here. This rice pilaf looks so tasty and healthy, too! What a gorgeous rice dish! 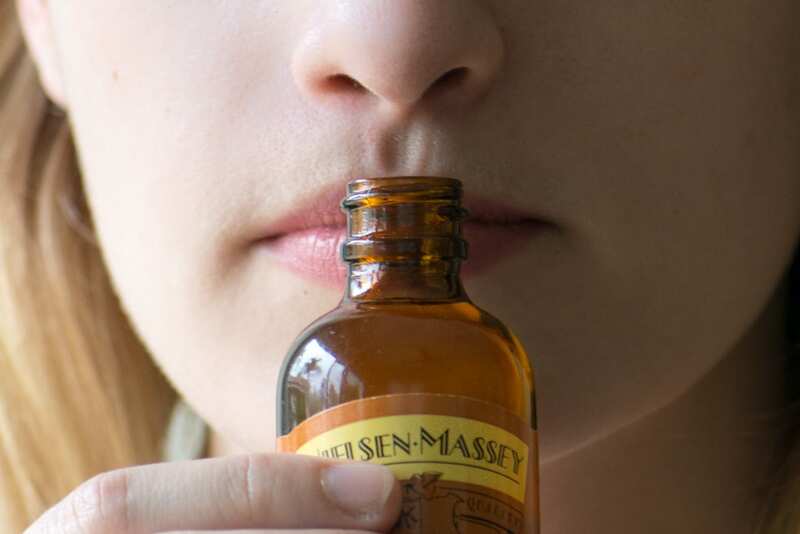 I’ve long been a fan of Nielsen-Massey vanilla, but I’ve never had their almond extract. I love the idea of using it in a savory application like this! I would have never thought of flavouring rice with almond extract, but I totally trust your taste, Sue. The pilaf looks utterly delicious. I’ve been using vanilla in savory dishes for a while now, but using almond was new for me…I’m hooked! I am not able to open a bottle of their almond extract without taking a big, giant whiff! I adore their products and buy nothing else if I can help it! 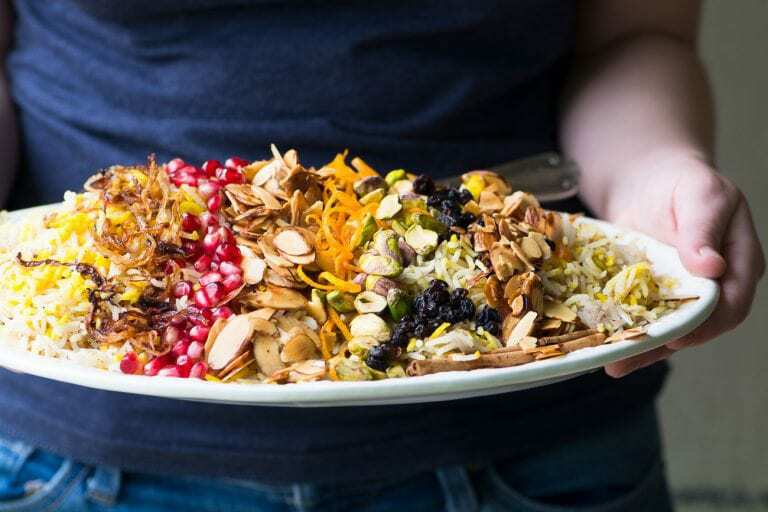 This is the prettiest pilaf I’ve ever seen and I really can’t wait to make it. How delicious! Truth be told, everything gets stalled in the kitchen while I stand in a corner with my bottle ;) Thanks Tricia!